How can I find the frequency of this signal? 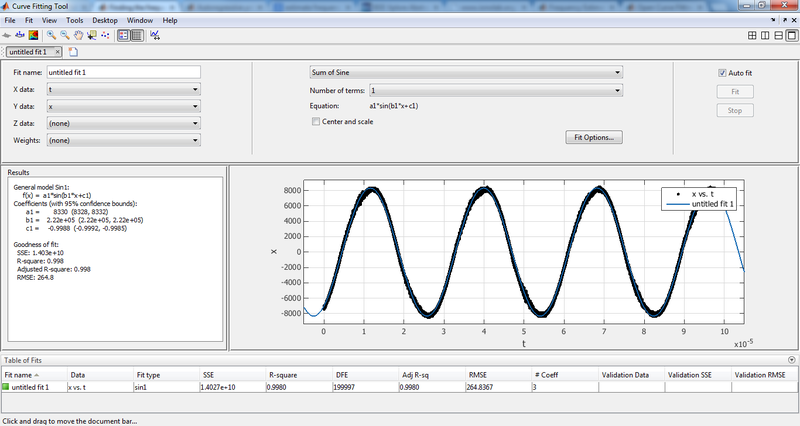 I am new to matlab , when I use same code for spectrum , i didn't get any except that noisy signal. pwelch() and plot() are required. We can't say anything more without your code and data. f is returned by pwelch() - see the documentation for that. x is defined as "x = signal + noise;" so I don't know why it would say that, unless you tried to use it before you defined it. 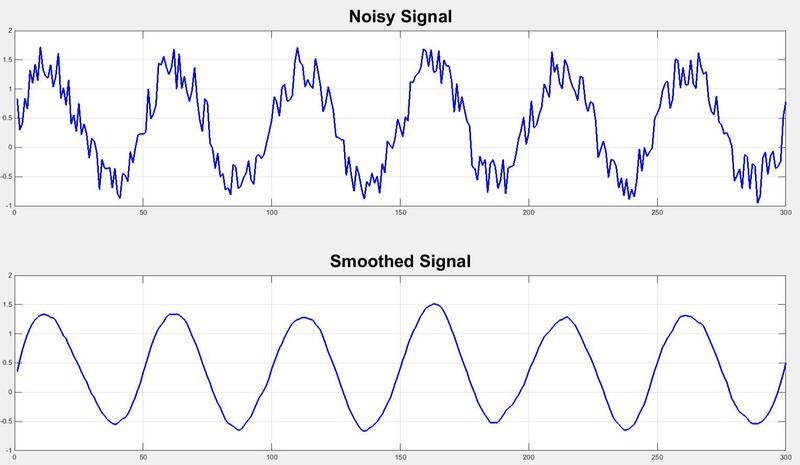 I'd smooth it a bit with a 3rd order Savitzky-Golay filter, sgolayfilt() in the Signal Processing Toolbox, then I'd use findpeaks to get the period and 1/period is the frequency. Attached is a Savitzky-Golay filter demo. I smoothed the signal however couldn't find the peaks, i guess i got too much points, about 20000 points which form the signal. so the peaks are 3900 points. Please attach your signal data and code. You must not have smoothed it properly or used good parameters to findpeaks(). Try increasing the window length in sgolayfilt() until your signal doesn't have any noise. Please upload your data file to this thread and I will modify my code to work with your data. Ah okay, so the entire capture is just a few sine periods long. That's very short for an FFT-based method, since the resolution of the raw FFT is fsamp/Nfft (i.e. 10kHz resolution with your data). 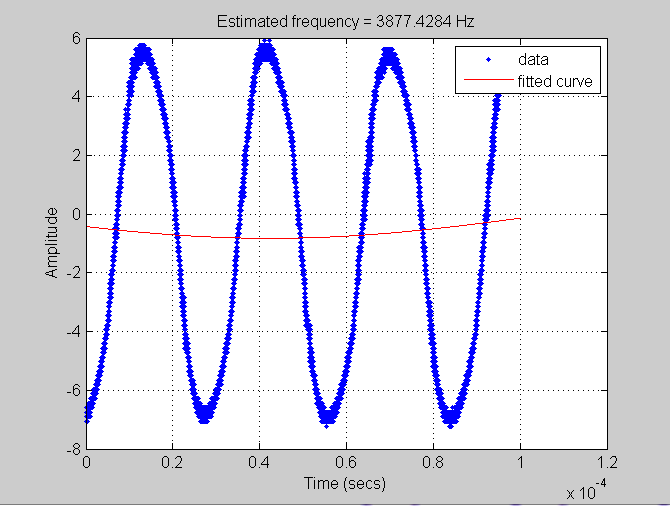 I modified my code for your data and it gives an estimate of 40kHz. However, as I said, this is only accurate to the nearest 10kHz at best. Clearly, you could make an equally accurate estimate just by inspecting your graph (in your first post). Therefore, we should try a different approach. This should be significantly more accurate than the FFT-based method. I think I would need to use FFT as its fully automatic even though its not accurate, so if you could just modify your code to work with my signal. I need an automated method! I must reiterate that a basic FFT-based method is a very poor approach for such a short data capture (relative to the period of the sinewave), since it gives a very inaccurate result. You can even get a more accurate result just by looking at the graph and saying the period between the first peak and the second peak is about (40.2μs-12μs) = 28.2μs. 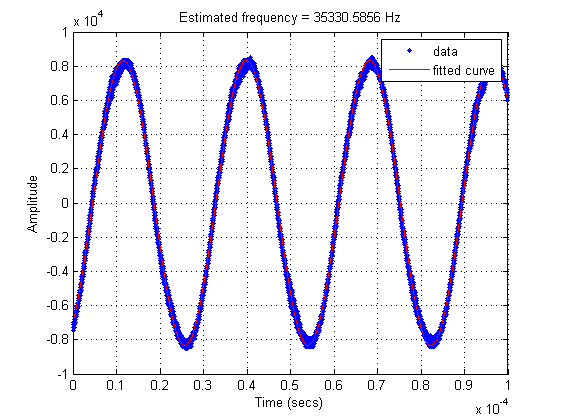 Therefore, the frequency is about 1/28.2μs = 35.461kHz. If you could explain the equation you have used please? 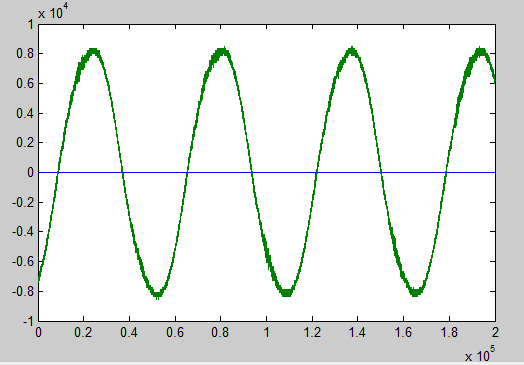 and by the way I have tested your method with another signal it seems that it gave me the right frequency, however the sine wave didnt match at all.